Culinary elegance is easy to achieve with the versatile Fine Shred Cone, whether you're creating wispy vegetable curls to garnish a special soup, composing a delicate sauce for fish, or decorating elegant hors d'oeuvres. Fine shreds add a hint of flavor and a touch of fancy to most anything. Whip up delicious new dips or top luscious sundaes. Dress up many everyday favorites too, like pastas, casseroles, chili, omelets, baked potatoes, bagels and more. 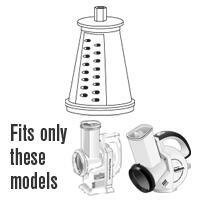 For use only with the Professional and Professional SaladShooter® Plus electric slicer/shredder.